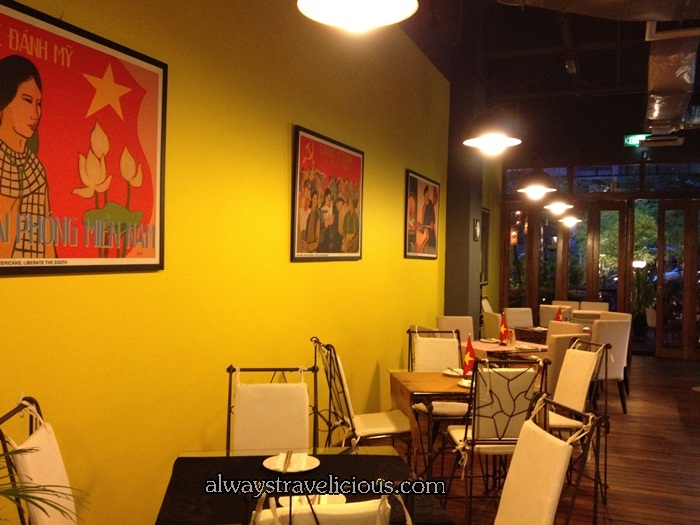 Sao Nam Vietnamese Restaurant @ Empire Mall Subang Jaya - Always Travelicious ! Sao Nam Vietnamese restaurant is a refreshing restaurant in terms of everything. In terms of food, interior decoration, and menu selection. It was the unique interior design that first drew my attention as we were walking around Empire Mall. While most Vietnamese restaurants focus their interior decoration on cultural aspects of Vietnam, like hanging Vietnamese hats or lanterns on the wall, or pictures of Vietnamese people with rivers as their lives are so intertwined with rivers. In Sao Nam, the most prominent aspect of its interior design is its strong attribute of communism and China. In my school years, I never liked history as a subject and nor would I have thought historical elements could have been incorporated into a restaurant to create an unusual, amusing and historical ambiance, using Mr Mao’s striking red with a contrasting brilliant yellow. The seating areas are comfortable and the communism idea doesn’t end with the striking walls and Mr Mao’s statue. There are red little flags on all the tables too. I ordered the Fish Sour Soup Noodle (RM 18) as it is something that I don’t normally see on a Vietnamese menu. I was expecting raw been sprouts and basil leaves to accompany the dish, but came a refreshing handful of dill instead. The fish nuggets were fried but not oily and came in generous amount. My biggest surprise was with the soup. The soup was vegetable-based with plenty of tomatoes giving it that sweet and sour taste. There was something extra I couldn’t figure out though. While I was working my way through the noodles, I found the most unlikely item in the soup – slices of star fruit. I fell in love with the dish ever since for its use of so natural ingredients to make such a wonderful soup base. Gary ordered the traditional Hanoi Chicken Noodle Soup (RM18) that came with lots of fresh herbs, with bean sprouts and basil leaves to top up. I liked this dish too because the soup was flavorsome without being oily. The transparent kitchen is a cleaniness assurance to me. While the menu has typical Vietnamese dishes like the spring rolls, beef noodle soup, it also has the less common items – the Imperial Lotus Leaf Rice (RM18) and Rice Rolls Lotus Leaf (RM21), so beautifully presented on the menu. I was also delighted to see the dessert selection. If you ask me what Vietnamese desserts are, I would have been stunned because I don’t know. While the yam and sago in coconut milk is more of a South-East Asia thing, I am eyeing on the lychee and ginger ice to try next time. Here’s more of Sao Nam’s menu. The food was excellent, reasonably priced and speedy. I look forward to going back to Sao Nam again! Address: LG28 Lower Ground, Empire Shopping Gallery, Jalan SS 16/1, Subang Jaya.